What makes white people tick? This question will occupy campaign strategists and forecasters through November. Given that voters of color have, on the whole, decided resoundingly against Donald Trump, the coveted swing voters who will decide this election are overwhelmingly white. This is nothing new, of course, but in the wake of a campaign season that has played heavily on white identity politics, rejection of diversity and race-baiting dog whistles, the specific concerns of white voters have taken on a renewed salience. It’s an open secret in electoral politics that you can guess someone’s vote pretty accurately based only on her census form. So rather than trying to suss out the sentiments and ideological profiles of voters based on individual testimony, let’s tackle a simpler question: Which demographic traits affect how white Americans vote? A detailed FiveThirtyEight/SurveyMonkey poll conducted this summer1 contains the depth of data necessary to answer this question. Rather than just giving us top-level demographic info, this poll lets us look at intersectional stats, too — for example, what percentage of suburban black women support Trump.2 So we can take any subgroup of the population (in this case, white voters) and see which variables most affect their vote preference. Let’s start with the wrong answer: income. Despite the myth that Trump’s base is poor whites, income is the least predictive3 of white voter support among the seven demographic variables tracked by the poll. More precisely, we can assign an educational score (no college = 0, some college = 1, college degree = 2) and religious attendance score (never attend = 0, sometimes attend = 1, attend weekly = 2) to each white American. Those with a higher education score are likely to support Clinton, those with a higher religious attendance score are more likely to support Trump, and those with equal scores are more divided. One quick side note: The three groups in the middle, with “equal influence” from college and church — none/never, some/sometimes and degree/weekly — can be further explained by the third-most predictive variable, urban/suburban/rural residence. Urban voters lean left while suburban and rural voters lean right. Theory No. 1: Different values. 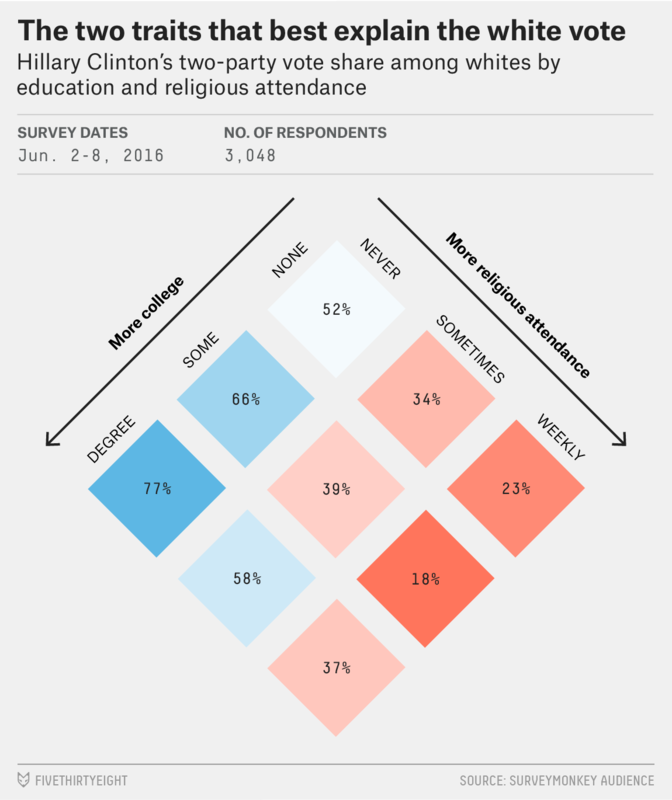 College whites and church whites are taught different moral values in their respective houses of learning, values which trickle up into policy preferences. Members of white Christian congregations are more likely than any other racial-religious group to rank personal responsibility above structural factors, such as unequal access to education, in explaining racial disparities in income. And while secular universities rarely purport to give moral teachings to their students, research has found that college education increases tolerance. This is not to say the GOP is the only party of Christian values; blacks and Latinos, who are overwhelmingly Christian, are mostly Democrats. Rather, Republican ideology seems to be aligned with the values taught in historically white churches: For instance, black and Hispanic members of interracial congregations hold the same individualistic social attitudes as white churchgoers, suggesting that they may adopt these conservative views after extended exposure to white church values. Theory No. 2: Different knowledge. Another possibility is that college whites and church whites disagree not only on value judgments but on empirical claims about the world. The statement “climate change is caused by human activity” is slightly more likely to be affirmed by those with a college degree; the statement “life begins at conception” is more likely to be affirmed5 by those with regular church attendance. This theory seems particularly popular among college whites, in no small part because it frames their conservative adversaries as not just misguided but misinformed. And unless you want to get epistemic about the validity of empirical research, it’s hard to deny that university education increases scientific literacy. Theory No. 3: Different bubbles. The flip side of Theory No. 2 is that both college whites and church whites exist in ideologically pure bubbles, where like-minded friends uncritically reinforce each other’s beliefs. Indeed, college graduates have few less-educated friends; it is also true that liberal professors outnumber conservative professors nearly 5-to-1. The development of public policy in universities and think tanks, then, may not be a crusade for objective knowledge so much as a cartel of secular elites peer-reviewing and advising secular elites for the benefit of secular elites. These theories aren’t mutually exclusive, of course, and there may be some element of truth to each of them. But understanding the massive college-church divide helps explain why this election feels less like a debate over policy and more like a war of worldviews. Methodology is here. Questionnaire is here. The survey was conducted June 2-8. That is ages ago in election time, but while exact numbers may have moved as the horserace has shifted, the overall demographic patterns have likely remained intact. It’s 4 percent, if you’re curious. I’m using “predictive” to mean the gap between the most and least Clinton-leaning subgroups created by a given variable. I’m using “church” a bit loosely, since the survey question concerns all religious ceremonies. I couldn’t find a single poll that shows this result directly, but “life begins at conception” is more likely to be affirmed by pro-life respondents, who are in turn more likely to attend church regularly.